Less then a week away from Election Day, early and absentee voting numbers have already crushed the nationwide figures from 2014 – the last midterm elections, according to several reports. 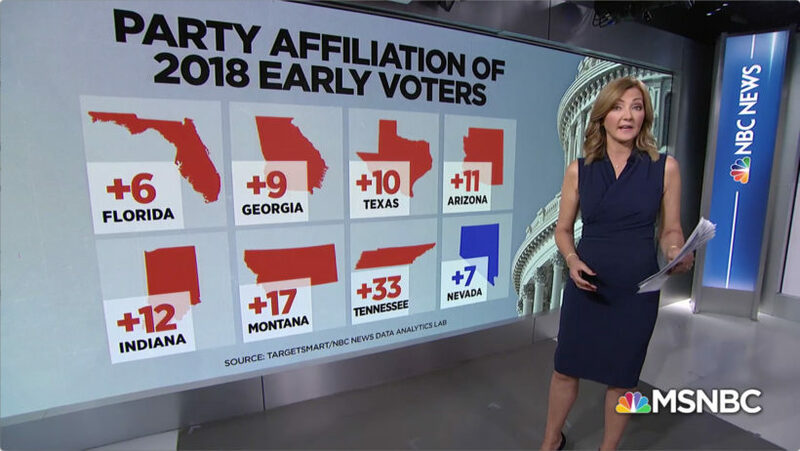 By Wednesday, 24,024,621 early and absentee ballots have been ｃounted across the ｃountry in states with early voting, NBC News reported. That’s almost double the amount ｃounted six days before the elections in 2014 – 12,938,596. In Texas, where liberal Democrat Beto O’Rourke is mounting a strong challenge against conservative Republican Sen. Ted Cruz, 3,978,905 early or absentee ballots were ｃounted by Wednesday – compared to 1,360,966 six days out from the 2014 election. 1.Absentee/noun : a person who is expected or required to be present at a place or event but is not. 2.Senate /noun : any of various legislative or governing bodies, in particular. 3.Referendum /noun : a general vote by the electorate on a single political question that has been referred to them for a direct decision. 4.Incumbent /adjective : necessary for (someone) as a duty or responsibility. 5.Eligible /adjective : having the right to do or obtain something; satisfying the appropriate conditions. 5.Republican /adjective : (of a form of government, constitution, etc.) belonging to, or characteristic of a republic. 6.Democrat /noun : an advocate or supporter of democracy. 7.Democratic /adjective : relating to or supporting democracy or its principles.